For 60 years, we’ve witnessed some of the most talented and celebrated artists take the Grammys stage to perform, and pick up an award or eight. You can bet that there will be a few surprises this year as The Recording Academy gears up to honor musicians for artistic excellence in a variety of categories. Count down to music’s biggest night with 11 performances from the past that we’re still talking about today. The 61st annual Grammys will air live on Sunday, Feb. 10 on CBS at 8 p.m. ET/5 p.m. PST from the Staples Center in Los Angeles. Kendrick Lamar, Dave Chapelle, and Lady Gaga. Enough said. (Kevin Mazur/Getty Images for NARAS) Beyonce performs onstage during The 59th GRAMMY Awards, Feb. 12, 2017 in Los Angeles. 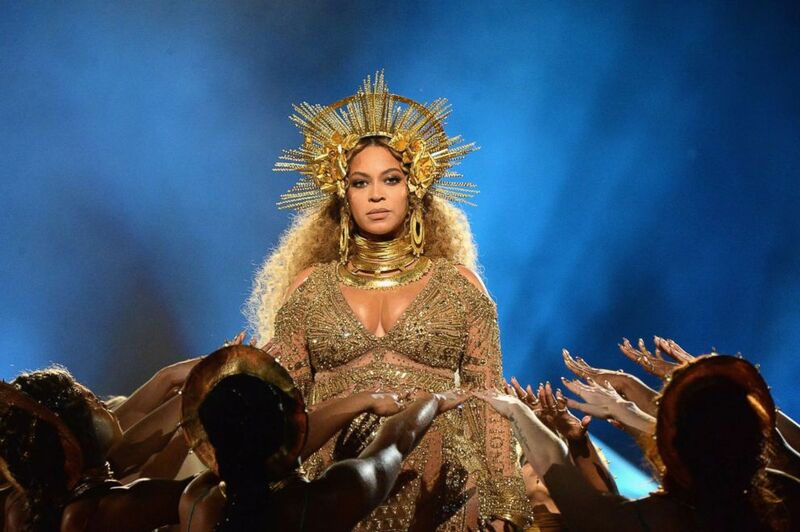 In 2017, the Grammys promised a Beyonce performance “that would have everyone talking.” As we all know, she delivered on that promise -- exceeding expectations and defying gravity with one of the most memorable performances in Grammy history. It would be nearly impossible to discuss the 2017 Grammys without mentioning Adele. Along with the nearly 25 million viewers who tuned in that night, she had us at “Hello,” opening the show with her No. 1 single that spent 10 weeks in the top spot on Billboard’s Hot 100 chart. Clive Davis, who signed Whitney Houston to his record label at 19, recalled when he first heard the future superstar sing a cover of “Greatest Love of All” at a club in New York City. “Whitney sang the song with such fervor, with such a natural vocal gift, with such passion, that I was stunned. I knew really right then and there that this was a special talent and I was blown away by her. There was no hesitation. I wanted to sign Whitney.” The song would eventually make it onto her debut album and spend three weeks at No. 1 on the Hot 100 chart. Her Grammys performance is timeless and flawless -- and the way she holds the last note will give you chills. She deservedly received a standing ovation. (M. Caulfield/WireImage/Getty Images) Christina Aguilera performs during the 49th Annual GRAMMY Awards in Los Angeles, Feb. 12, 2007. In 2007, Christina Aguilera brought down the house with her rendition of James Brown’s "It's a Man's Man's Man's World.” In fact, her tribute to the late "Godfather of Soul” is often referred to as one of the best live performances of all time. Aguilera later included the spellbinding cover on her 2018 Liberation Tour set list. It was undeniably Amy Winehouse’s night at the 50th Grammys in 2008, where she took home five awards (Best New Artist, Best Pop Vocal Performance, Best Female Pop Vocal Performance, Record of the Year and Song of the Year), setting a record at the time, and earning an entry in the 2009 edition of the “Guinness Book of World Records” for Most Grammy Awards won by a British Female Act. Amy Winehouse - You Know I'm No Good & Rehab Live Grammys 2008 from Luis Rodriguez on Vimeo. (Lester Cohen/WireImage/Getty Images) Lady Gaga performs onstage during The 53rd Annual GRAMMY Awards, Feb. 13, 2011, in Los Angeles. To say there was buzz surrounding Lady Gaga at the 2011 Grammys would be an understatement. How’s this for an entrance: she arrived on the red carpet in the midst of a metaphorical rebirth, carried in an incubating vessel (which she claims she stayed in for three days prior as part of the creative experience) before “hatching” out to perform her No. 1 single “Born This Way.” By doing so, Gaga gave us her version of “An Actor Prepares” -- demonstrating her undeniable passion and dedication to her craft. The two opened the show with a medley of four songs, and the energy between them was electrifying. If the experience of performing with one of her idols wasn’t enough for Beyonce, she also took home five awards, the most of any artist that night. Ready or not, that same night, Annie Lennox dressed in drag to perform Eurythmics’ No. 1 single, “Sweet Dreams (Are Made of This).” The performance is so iconic it arguably inspired future superstar Lady Gaga, who opened the 2011 MTV Video Music Awards as her alter ego Jo Calderone. The Grammys pushed the envelope in 2006 when animated band Gorillaz performed its hit single “Feel Good Inc.” as 3-D holograms. Hip-hop trio De La Soul (in the flesh) joined in for their part in the song, and yet, there was one more surprise in store. A Madonna hologram emerged on stage and began singing her hit dance club anthem “Hung Up” as one song blended into the other. And for the grand finale, the “human” version of the queen of pop transformed the Grammys stage into a full-blown disco dance party.